1. 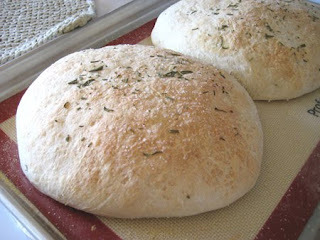 Combine yeast, sugar, water, rosemary & olive oil. Let sit for 5 minutes. 2. Add flour and salt until dough forms. Do not overknead! 3. Let rise in a greased bowl for 1 1/2 hours until doubled in size. 4. Turn out onto cornmeal covered pizza/baking stone and let rise additional 30 minutes. 5. Brush with egg white & bake at 400 F for 30-35 minutes. 6. Serve with balsamic vinegar & olive oil for dipping.